Newry Wheelers recently held their Annual Charity Sportive event on March 25th. 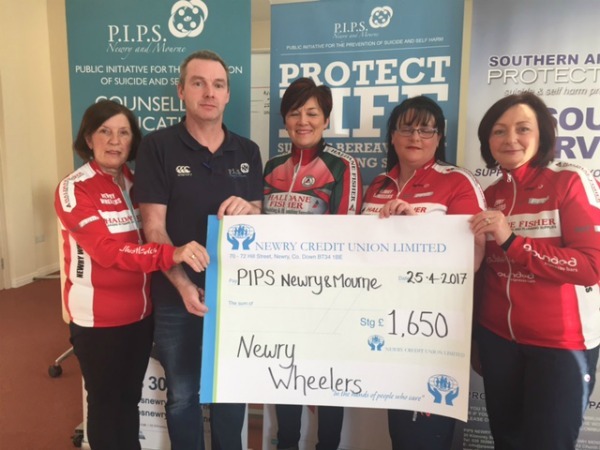 This year the club selected local suicide prevention charity PIPS Newry and Mourne to benefit from the cycle. Despite the terrible weather conditions the brave cyclists completed the sportive and raised a fantastic £1,650.00 . Pictured are Tish O'Hagan, Margaret Strain, Caroline Sands and Pamela McKinley of the Newry Wheelers Cycling Club presenting the proceeds of the event to Eamon Murphy of PIPS Newry and Mourne. PIPS Newry and Mourne would like to thank everyone who registered for the Sportive, Newry Wheelers Club and everyone who volunteered on the day in particularly poor conditions.